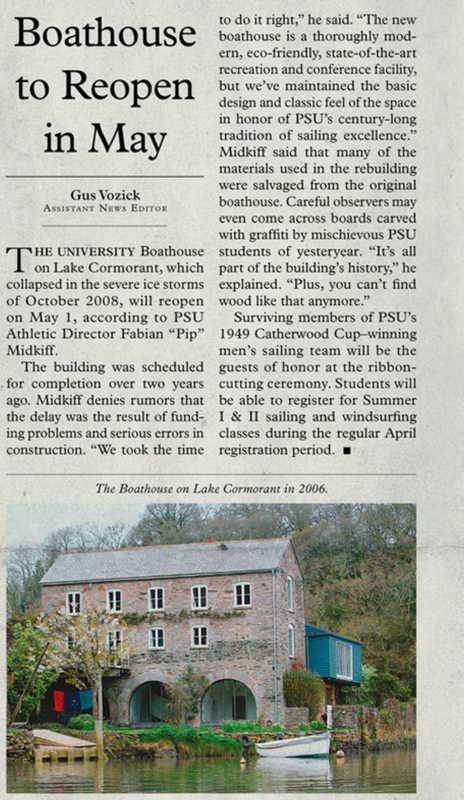 Pronghorn State University | Thoughts On "S"
THE UNIVERSITY Boathouse on Lake Cormorant, which collapsed in the severe ice storm of October 2008, will reopen on May 1, according to PSU Athletic Director Fabian “Pip” Midkiff. Surviving members of PSU’s 1949 Catherwood Cup-winning men’s sailing team will be the guests of honor at the ribbon cutting ceremony. Students will be able to register for Summer I & II sailing and windsurfing classes during the regular April registration period.